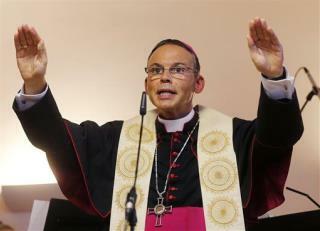 (Newser) – A German bishop has been called to the principal's office after his exorbitant spending. Franz-Peter Tebartz-van Elst—or the "Luxury Bishop" as the BBC calls him—is under fire for spending $42 million on his house and then lying about it. Some have called for him to resign. Now he's at the Vatican (where he reportedly flew via "budget airline") to meet with Archbishop Robert Zollitsch, and possibly even Pope Francis, who has urged Church leaders to live modestly. Gosh! Looks a lot like Jim Bakker. hmmm.... Does it have a theme park? I am not going to diss anyone for choosing business class on a long, international flight. But the rest of this story is just astonishing. Where the hell did he get all that money to build the house---is he independently wealthy? Did some parishioner will it to the church? How could that much money be spent and no one notice till now?